Easily Make your own Professional ScreenSaver in Minutes ! make screensaver based on multimedia file formats: images (BMP JPG PNG GIF...), sounds (WAV MP3 MID RMI WMA), movies(AVI MOV WMV MPG RM), animations (Flash, Autodesk Animation) and webpages. Download Now to make your own Christmas and New Year Gifts! 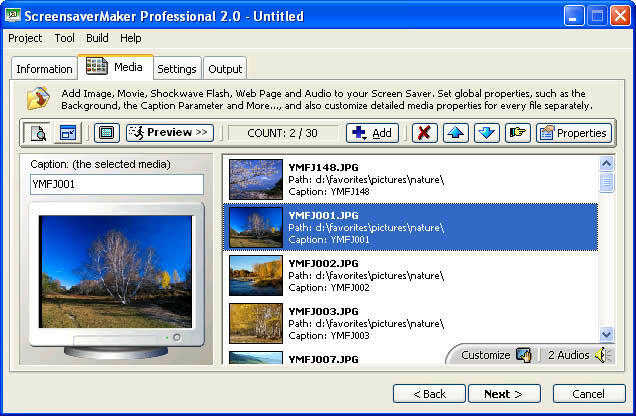 ScreensaverMaker is a powerful tool to create and distribute screensaver for Windows. It has a fully integrated workspace that permits you to work efficiently and create professional screensaver in minutes. lets you create your own screensaver based on Shockwave Flash (no limit to your imagination! ), Image Slide Show (display your favorite photos) and Movie (MOV RM Mpeg AVI...). 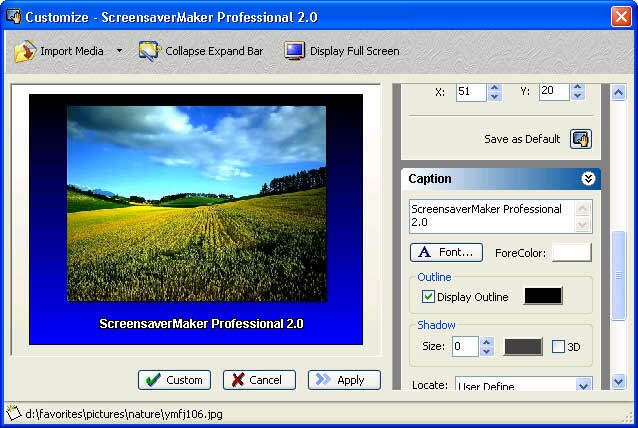 ScreensaverMaker Several options are available: More Files Support; MIDI, MP3, WAV, WMA Background music support; Transition Effect support; Masking Effect support ; Customizable screen saver Dialog box; sell your screen saver option; Image Masking Effect support, new file formats supported: PSD, PNG, GIF, TGA, TIF, PCX, and the ability to preview selected video file in the open file dialog. 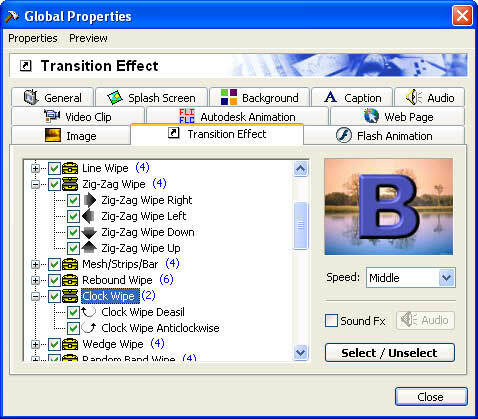 ScreenSaver Maker - BMP (Windows), DIB (Windows), GIF (CompuServe), JPEG (JPEG), PSD (Photoshop), PNG (Portable Network Graphic), PCX (Zsoft), TGA (Targa), TIF (TIFF), SWF (Shockwave Flash), MP3 (MPEG Layer 3), MIDI/RMI (MIDI Music), WAV (Windows WAVE), WMA (Windows Media Audio), ASF (Microsoft video), AVI (Windows video), MOV/QT (QuickTime video), MPEG (MPEG I video),WMV(Windows Media Player Video) . These files formats can be added to Screen Savers! Make Shockwave Flash Screensaver - Now you can create limitless screen savers using Macromedia Shockwave Flash. The popular Web animation format lets you to create beautiful and powerful vector animations with sounds, collision detection, text effects and more.... You can also create screen savers that allow the user interact with. Why don't create a tic-tac-toe screen saver or a small video game? Now, all is possible with Flash.specify many parameters (random position,mouse option,size and more...) ! Make Movie Screensaver - Now you can create movie screen saver in a few minutes , specify many parameters (size , mute sound , continue where stopped). All the popular file formats are supported: AVI, MPG, ASF, QT, MOV, and more! Internet ScreenSaver Builder - Make screen savers updateable via Internet. Use images, text and avi/wav/mp3 files with wizard. Hot!